Marc Highbloom, the founder of Colorful Hands, is an experienced marketing & business development executive with nearly 20 years of broad-based know-how and a background combining strategic planning, new product development, product launches and Internet marketing initiatives in both the consumer and business-to-business marketplaces. It all started in Westchester County, New York (45 minutes north of New York City) with Marc and his two young daughters, Taylor and Madison. In his spare time, Marc and his children teamed up to create beautiful finger-paintings that were then collaged into fun, colorful and full of life pieces of artwork. For the most part, Taylor and Madison did the hard part of putting paint to paper. “It really was a treat to see my daughters having so much fun swooshing, swirling, and splattering just four primary colors into rainbows of joy.” Marc supervised Taylor and Madison as they created large vibrant swatches of color with their tiny hands, and sometimes feet. The sheets of finger-painted paper were dried, then methodically and time consumingly cut and pasted into fun, rhythmic, poetic pieces of art. This creative family project triggered the concept for Colorful Hands and has been the cornerstone of the business ever since. 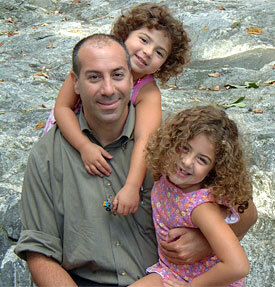 Marc Highbloom is a proven creative entrepreneur and when he’s not growing the businesses, Marc is thinking-up creative projects to keep his little girls entertained and out of trouble. Marc's true passion comes from his Fine Arts background and his quest for adventure. He’s extensively traveled the world to countless countries on almost every continent taking on the challenges of meeting new people and cultures and surviving the best Mother Earth and Nature have to offer. Marc hopes to pass that sense of adventure and zest for life onto his children by teaching them how to do their part in making the world a beautiful and colorful place, for themselves as well as for others. 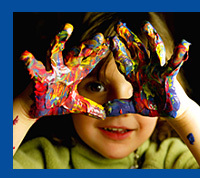 Colorful Hands and its logo and artwork are trademarks of The Highbloom Group. Copyright © 2005 all rights reserved.